My first assignment of the year was a single lesson plan. The brief required me to create a lesson plan focused on either poetry or short stories for a year nine or ten class. I chose to focus on poetry at a year nine level. This assignment took me two weeks. Two weeks of planning, creating, recreating, evaluating, scrutinising, practising the lesson while my husband played the student, fixing the bugs, practising it again, and again, and again – until it was perfect. Last week, I designed a ten-week unit in half an hour. With every single lesson covered. My first practicum was a rude awakening. I didn’t have two weeks to plan every lesson. I had to plan two weeks worth of lessons in the space of one lesson. Time is one of the most valuable things, and I realised that to get through the year, I needed to become a time guru. On practicum I filled every spare moment with purpose, be it teaching, planning, or becoming acquainted with the English department. Learning to manage my time saved me this year. But, I still had a lot to learn about time. Time is needed to build effective relationships with students. For relationships are at the heart of teaching. I think I was told that in my first lecture, and every day since it has proven to be true. But common ground also came in the form of Leonardo DiCaprio in Baz Luhrman’s Romeo and Juliet, using social networking to understand characters (which 14 year old girl doesn’t want to create a Facebook page for Romeo Montague!? ), talking about hipsters while teaching the films of Wes Anderson, creating lonely hearts ads for Benedick from Much ado about Nothing, or something as simple as asking how the Lorde concert was (amazing, they said), or suggesting a good book. I learnt that by making time to intentionally build relationships with learners resulted in them being more engaged in class. They wanted to learn, as much as I wanted them to. It wasn’t about being cool, or wanting them to like me, it was about authentically getting to know them, letting them know that their stories were (and are) important to me. Planning and relationships met perfectly when I put in time and effort to design lessons that I knew the class would like. One of my favourite lessons I taught was when I found myself needing to teach homage and intertextuality. Incidentally, Lady Gaga’s new video Applause has a multitude of cultural referenced embedded within it’s frame. Among a multitude of other references, Gaga’s video paid homage Warhol, Madonna, Icarus, David Bowie, Botticelli, Rolling Stone Magazine, and Alexander McQueen. I used this video to as an example of homage and created a huge ‘bingo’ sheet. The video was played, and in groups the students needed to guess what images on the sheet were referenced, the group who got the most would win (of course candy was involved). I found that this activity allowed them to ‘get it’ and when we turned back to our teen film genre study, they were not able to pick up on references to 80’s teen films that exist in teen films today, but they also understood why the filmmakers did this. I could’ve just handed them an info sheet that explained what homage was, but I’m glad I didn’t, because the learning and relationships that stemmed from that lesson showed me it wasn’t a waste of time. Time is also needed to map my learning journey. So, I created a blog that chronicled my experiences. I put aside some time every so often to blog about what I have been up to, what I have learnt, and my thoughts towards it all. My blog has allowed me to see the huge impact this year has had on me. 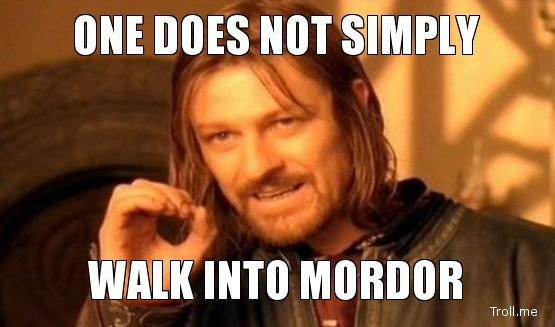 I feel like the title of my blog sums up what I have learnt – One does not simply just walk into a classroom and teach. Why did I name it this? Because one doesn’t. As much as Rodney Hide thinks it is – teaching is not that easy. You need to have more than content knowledge. So much more. If I was to walk into a classroom on the 28th of January at the beginning of this year I would not have known where to start, I’m afraid I might have defaulted to the lecture style teaching that was the norm in my undergrad. Sure, content knowledge of my subject is important, but so is behaviour management, pedagogical theories, concepts on how to teach the content, accessing prior knowledge, scaffolding, relationships, the curriculum content and how to use it, planning strategies, assessment theories, strategies for teaching diverse learners, motivation and engagement, metacognition, and the history of education (amongst countless other things). I learnt none of this until this year. I could have guessed or used my instincts for some things (behaviour management and relationships), but everything else is so central to teaching. This year I was taught how to teach; there is no way I would be an effective teacher without this training. But, of course, I am still learning. And I will always be learning. I will never be at the end of this journey, and this is something that I am grateful for. As I said earlier, learning to manage my time saved me this year, but I still had a lot to learn about time. I still have a lot to learn about everything, there will always be so much more for me to know, to learn, and to experience.